Flame Resistant Costumes: When purchasing a costume, masks, beards, and wigs, look for the label Flame Resistant. Although this label does not mean these items won’t catch fire, it does indicate the items will resist burning and should extinguish quickly once removed from the ignition source. To minimize the risk of contact with candles or other sources of ignition, avoid costumes made with flimsy materials and outfits with big, baggy sleeves or billowing skirts.  For greater visibility during dusk and darkness, decorate or trim costumes with reflective tape that will glow in the beam of a car’s headlights. Bags or sacks should also be light colored or decorated with reflective tape. Reflective tape is usually available in hardware, bicycle, and sporting goods stores. 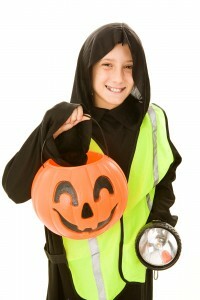  To easily see and be seen, children should also carry flashlights. 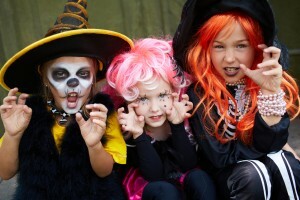  Costumes should be short enough to prevent children from tripping and falling.  Children should wear well-fitting, sturdy shoes . Mother’ s high heels are not a good idea for safe walking.  Hats and scarfs should be tied securely to prevent them from slipping over children’s eyes.  Apply a natural mask of cosmetics rather than have a child wear a loose-fitting mask that might restrict breathing or obscure vision. If a mask is used, however, make sure it fits securely and has eyeholes large enough to allow full vision.  Swords, knives, and similar costume accessories should be of soft and flexible material.  Children should not enter homes or apartments unless they are accompanied by an adult.  People expecting trick-or-treaters should remove anything that could be an obstacle from lawns, steps and porches. Candlelit jack-o’-lanterns should be kept away from landings and doorsteps where costumes could brush against the flame. Indoor jack-o’-lanterns should be kept away from curtains, decorations, and other furnishings that could be ignited.